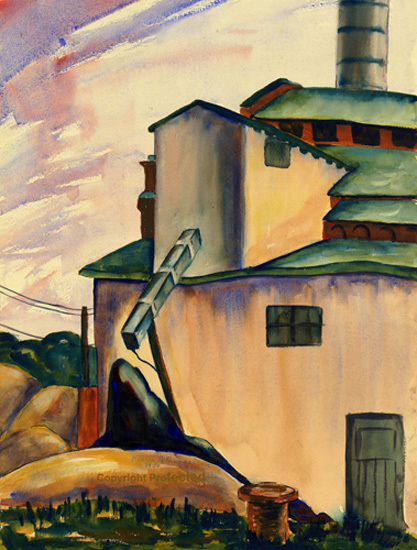 In case the first “Vantage Point” post about Mother’s (Marion Gunderson) ISU Heating Plant watercolor was just a little too detailed for you, here’s the cut-to-the-chase version. At left is the image of her watercolor (same image as in the first post). I’m also including a photo-with-explanation indicating her most likely vantage point for the watercolor. At the end of this post are links that provide more information about Iowa State University’s heating/power plant. 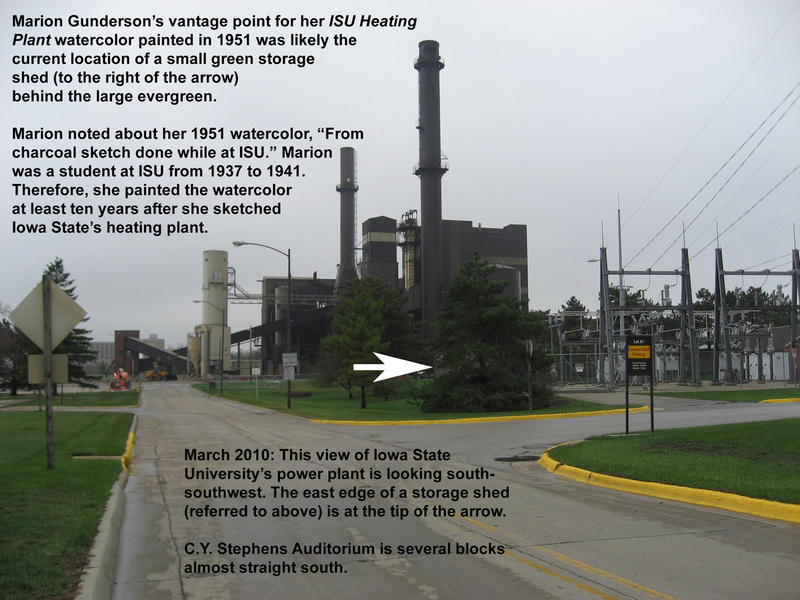 At the links below, more information is available about the history of Iowa State University’s heating/power plant, or current information. This Iowa State University link (http://www.fpm.iastate.edu/maps/) provides a map of campus. To easily see the location of the current power plant, in the upper right at this ISU web site you’ll get a pop-up menu if you click on “select building.” In that pop-up menu, select “power plant.” OR, at the left side of the same web page where it says “Layers,” put a check mark in front of “building names.” Then enlarge the map (i.e., click on the “+” sign) a little and you’ll be able to see the names of buildings on campus. This entry was posted on June 11, 2010 at 11:14 am and is filed under Marion Gunderson. You can follow any responses to this entry through the RSS 2.0 feed. You can skip to the end and leave a response. Pinging is currently not allowed.